The letter containing my great-grandmother Valeria's story of her immigration from Poland to America. Excerpt: "I eagerly delve into the letter, hoping to connect with an unknown ancestor and build a sort of cultural identity through knowing the experiences and hardships of my family members." One letter catches my eye. Iâ€™ve been lying on my grandmotherâ€™s living room floor for what feels like hours, trying to make sense out of the photos and postcards strewn across the carpet. Buried under piles of my fatherâ€™s high school transcripts and prom pictures, five sheets of paper contain typewritten names that I don’t recognize. I put aside for a few minutes my summer assignment of clearing my fatherâ€™s modest childhood Cleveland home of all the memorabilia my packrats for grandparents had saved, and glance over the first few lines of the correspondence between George and Steve. They are two names that I’ve never heard before. I call my father over from the bedroom he is cleaning and present him with the mysterious letter, asking him the identities of the author and recipient in hopes of understanding the letterâ€™s context. My father is a man who doesn’t feel the need to fill silences with pointless banter, and unless answering a direct question or issuing a demand, he barely speaks at all.Â He doesn’t indulge in small talk, let alone storytelling, so these artifacts acted as my first connections to relatives outside of my immediate family in Phoenix, Arizona. I assume that he would glance over the document, mumble something unintelligible, and continue on with the task I interrupted. He surprises me, however, by eagerly rifling through the text, nodding with understanding every few moments as he encounters a familiar anecdote. My dad explains that the communication was between my two great-uncles, my grandmotherâ€™s brothers, in 1994. George, writing from Chicago, had recently researched their familyâ€™s background, and provided the details of his findings to Steve at his request. 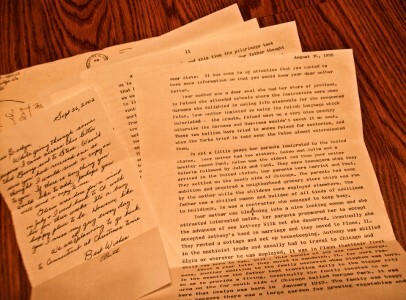 Knowing the context, I eagerly delve into the letter, hoping to connect with an unknown ancestor and build a sort of cultural identity through knowing the experiences and hardships of my family members. I kne that my fatherâ€™s family emigrated to the United States from Poland, but until reading the letter, I took for granted their struggles with a language barrier, and the loss of familial and close connections. I considered them abstract characters in a fable. In the letter was reference to a woman about my age who’d endured hardships I’d never been confronted with. Once in America, Valeria, still a teenager, was pressured by her parents to marry Anthony Wilk, the son of a family friend. The couple bore three children, the youngest my grandmother, Evelyn. Wilk had difficulty holding a job, so the family frequently moved in search of new business ventures to support itself. George blamed the familyâ€™s financial instability on his father, and professed that Valeria had a knack for business that kept the family afloat. After I finish the letter, my dad fills me in on the ending of her story: Without the support of Wilk, Valeria invested in four acres of farmland in Schaumburg outside Chicago, providing her children with the means to possess a significantly large inheritance. However, her husbandâ€™s gambling debts ate away at the majority of the savings. It is evident from the animated tone my father uses to convey the conclusion that he shares a similar sense of pride for Valeria, a result of being directly descended from such a strong-willed, independent woman. My dad’s exuberance captivates me. It is a story that contains a perseverance I want to reproduce in my own life. Discovering an ancestor who embodied the values of self-sufficiency and determination that I strive to possess in my life not only has brought about a feeling of understanding of my familyâ€™s past, but has proven to me that I have the potential to have them as well. After all, itâ€™s in my blood.